I want to say a few words about whether a debt owing to the Social Security Administration for overpayment of benefits can be discharged in a bankruptcy. Often it can be. If you have received Social Security you know that several factors, many of them beyond your control, can affect whether you are eligible and for how much. This is especially true of disability benefits. A change in status can end your eligibility or reduce the amount. It’s all very complicated and hard to understand – especially if you are ill. The Social Security Administration is a big and cumbersome organization that makes lots of mistakes. Lots of times they pay benefits when they are not supposed to. Often this happens because they can be very slow in processing information they receive from beneficiaries. The impression I have is that most beneficiaries are very careful about complying with requirements that they report any change in their circumstances. If you report the change and the benefits keep coming, most people would assume that the change didn’t make a difference. Later, however, you may be shocked to receive a nasty letter from the Social Security Administration. The letter claims that you have been overpaid and demands repayment. Suddenly you have a very large debt to a federal government agency. Nobody is more powerful. They might start withholding from the benefits you are still eligible for; they might seize your tax refunds; or they might even start garnishing your wages. Most people assume that like the usual student loans and taxes, there is no way to make this go away. This is what I assumed too the first time someone came to my office with one of these letters. I was surprised to learn when I did a little research that many if not most of these Social Security overpayment claims can be discharged in bankruptcy. When a debt like this is listed in a bankruptcy, it is going to be discharged unless the Social Security Administration successfully objects. In order to figure out whether to expect an objection, it is helpful to check Social Security policies as published in their on line Program Operations Manual. The guidelines as to when such an objection should be filed are in GN 02215.196 of the manual. They will object if they believe they can prove that the overpayment was a result of fraud or misrepresentation. They use a three part test to define what they mean by misrepresentation. There must have been 1) an overpayment caused by false representation, 2) made with the intent to deceive and 3) upon which the Social Security Administration relied to it’s detriment. The typical person I see in my office who with one of these overpayment letters isn’t anywhere close to satisfying the above test. This person hasn’t told any lies and certainly wan’t trying to deceive anybody. There was no intent to cheat the government out of anything. It was more a matter of just stumbling into the situation. If this is where you find yourself, you might want to give me a call. The chances that a bankruptcy can make the whole problem just go away are very good. Hard to Pay Those Troubling Holiday Shopping Bills? Around this past Thanksgiving CNBC published a report about how an alarming number of shoppers are still paying off debt from Christmas of 2016. A lot of the data in the report came from a source called NerdWallet. It seems that holiday-induced spending and debt is a growing problem. 24% admitted to overspending for the holidays of 2016. Among baby boomers, 64% went in debt to pay for Christmas. For Gen-X it was 58% and for millennials it was 40%. When it comes to not yet having paid off the 2016 debt, the millennials led with 24%. Gen-X came in at 16% and the boomers were at 8%. Make a good budget and stick to it. My reaction to this advice is to say to myself “well that’s easy for them to say.” Credit card debt has a way of sneaking up on a person. Not everyone is capable of paying their debt back. Many are overwhelmed and the bills that come in after Christmas can be the straw that breaks the camel’s back. If you are looking at your holiday bills and other debts in shock, perhaps it is time to consider another alternative. Once unsecured debt totals more than half of your annual income, it is usually impossible to get it paid back. For you a Chapter 7 or Chapter 13 bankruptcy might be a good idea. Recently I had a bankruptcy case where a seemingly small and innocent circumstance turned up after the case was filed. It seemed normal to my client at the time and certainly not dishonest in any way. It wasn’t illegal, immoral or fattening. It just happened, however, to be one of those things which can run afoul of some of the more nonsensical provisions of the bankruptcy code. I could have just said well that’s too bad and let things land wherever. Fixing the situation was probably beyond the scope of what I had signed on for in my retainer agreement. Many of the larger law firms, particularly the mills that crank out large volumes of cases for cheap, would have just let it go. Lawyers don’t promise that everything will be perfect; we don’t promise that nothing will go wrong. Sometimes it’s just too bad, isn’t it? But that kind of approach is just not how I do things. I really care about the outcome of my work and I really care about my clients. I just could not let it go. It would, and actually did, keep me awake at night. I started asking my client more questions, started asking for more documentation, more history. I explained that there was a problem, but I was aware of two or three exceptions, loopholes if you like, and I was determined to find one that fit. I found what I was looking for and put it together for presentation to the bankruptcy trustee. When I was finished, the trustee agreed with me that the issue was settled in my client’s favor and the case should proceed in the usual boring way. “If you have $70,000 in debt, why do you care ‘how much does it cost?’ Talk about being penny wise and pound foolish. Whatever the bankruptcy attorney charges, if the attorney takes care of you and eliminates as many of your debts as legally possible, protects your assets, and answers your questions, price is immaterial. When “how much” is someone’s first question to me, I get rid of them as soon as I can because they are telling me they don’t value what I do and will have to learn the hard way that NOTHING IS MORE EXPENSIVE THAN A CHEAP LAWYER.” Quoted with Ms. Bunce’s permission. That sure as heck says it all. This response is for general purposes only, is not legal advice and does not create an attorney-client relationship. I am a debt relief agency. I help people file for relief under the federal bankruptcy code. In fall of 2010 the bankruptcy judges in the Minnesota were getting upset. Their phones were ringing with calls from people who had questions that should have been answered by their lawyers; but these people were complaining that their lawyers would not return the calls. At about the same time the judges started hearing complaints from the trustees about lawyers not showing up for the hearings (meeting of creditors). It didn’t take long for them to figure out that there were a large number of new lawyers on the scene who didn’t know what they were doing. Just out of law school, they were trying to pay their student loans by jumping into what was at that time a booming bankruptcy market. Worse than that, however, many of these lawyers had been hired by fly by night petition preparation mills who were asking them to just sign off on bankruptcy petitions which had been prepared in India or who knows where. So although there was a lawyer’s name on the bankruptcy case, it had actually been prepared by an automated service. This resulted in many cases being filed on behalf of clients who had never actually talked with or met the person who supposedly was their lawyer. Lots of things were going wrong with these cases. This made it harder for everyone in the system. In an effort to remedy the situation, our judges created and began to require the use of the following “responsibility forms.” Although I was embarrassed for my profession – that it had come to this – when they first came out, I can now see that they have some value. I reproduce them here. Please note that the form for Chapter 7 is slightly different than the one for Chapter 13. Now that it’s been over six years since all that happened, it may be old news; but both the lawyer and the client are still required to sign these forms at the time a case is filed. By the way, usually when I discuss these forms with my clients, I refer to them as “the dummy checklist.” If it weren’t for some real dummies, we would not need them. This Notice lists certain responsibilities of debtors and their attorneys. Nothing in this document changes, limits, or in any way alters the debtor’s or the debtor’s attorney’s obligations under the Bankruptcy Code, the local and national rules, or any rule of professional responsibility. G. Timely prepare and file the debtor’s petition, plan, schedules, statements, certificates, and other documents required to commence a case, and review them for accuracy contemporaneously with the filing. K. Represent the debtor in bringing and defending any and all other matters or proceedings in the bankruptcy case as necessary for the proper administration of the case. III. The attorney shall comply with Local Rule 9010-3 and represent the debtor in bringing and defending all matters in the bankruptcy case until a substitution of attorneys is filed or an order is entered allowing the attorney to withdraw. Unless otherwise agreed, the attorney has no responsibility to represent the debtor in adversary proceedings. However, if an adversary proceeding is filed against the debtor, the attorney will explain to the debtor the estimated cost of providing representation in the adversary proceeding, the risks and consequences of an adverse judgment, and the risks and consequences of proceeding without counsel, as well as the sources, if any, of possible pro bono representation. 17. Any tax returns, account statements, pay stubs, or other documentation necessary to timely comply with requests made by the United States Trustee or the Chapter 7 Trustee or any audit requests. D. Cooperate with the attorney in preparing, reviewing, and signing the petition, schedules, statements, and all other documents required for filing a bankruptcy case. E. Complete an approved debtor education course and provide the certificate of attendance to the attorney for filing. VI. The chapter 7 debtor’s attorney shall, both before and after the case is filed, comply with all applicable professional and ethical rules and shall exercise civility in dealings with all entities with which the attorney comes in contact. The attorney shall also advise the chapter 7 debtor to likewise act in a civil and courteous manner, to dress in a manner appropriate for a federal proceeding and debtors shall do so. Signatures. By signing this acknowledgment, the debtor and the attorney certify they have read it and understand what is required of the debtor and the attorney in this bankruptcy case. A fully executed copy of this document must be filed with the petition commencing the bankruptcy case of the debtor(s). J. Timely prepare and file the debtor’s petition, plan, schedules, statements, certificates, and other documents required to commence a case, and review them for accuracy contemporaneously with the filing. O. Represent the debtor in bringing and defending any and all other matters or proceedings in the bankruptcy case as necessary for the proper administration of the case. 2. Proof of income received from all sources in the six-month period preceding filing, including pay stubs, social security statements, workers’ compensation payments, income from rental property, pensions, disability payments, child and spousal support, and income from self-employment. 17. Any tax returns, account statements, pay stubs, or other documentation necessary to timely comply with requests made by the United States Trustee or the Chapter 13 Trustee or any audit requests. H. Cooperate with the attorney to complete and sign the Chapter 13 Debtor’s Certifications Regarding Domestic Support Obligations and Section 522(q) immediately after making the final plan payment. VI. The chapter 13 debtor’s attorney shall, both before and after the case is filed, comply with all applicable professional and ethical rules and shall exercise civility in dealings with all entities with which the attorney comes in contact. The attorney shall also advise the chapter 13 debtor to likewise act in a civil and courteous manner, to dress in a manner appropriate for a federal proceeding and debtors shall do so. Signatures. By signing this acknowledgment, the debtor and the attorney certify they have read it and understand what is required of the debtor and the attorney in this bankruptcy case.A fully executed copy of this document must be filed with the petition commencing the bankruptcy case of the debtor(s). * Local Rule 2016-1(d)(2) provides that an attorney who performs these services after confirmation of the plan may request additional attorney’s fees and expenses in connection with such services. I’m not a paperless kind of guy. Hard copies of everything in a file folder. That’s how I like to do things. This of course means that I generate a lot of paper, and every few years I run out of storage space. After a Chapter 13 or Chapter 7 case is completed, the discharge has been granted and the clerk’s office has closed the case, I move the file to a storage room in the back of my garage. To me those files represent a lot of work, care, concern, blood and sweat. Gosh I hate to get rid of them. But a time comes when one has to let go. One has to admit that those people really did get a fresh start, they don’t need me any more, and it’s really time to move on and let go – physically let go of the file. 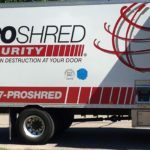 So it was with mixed feelings recently that I called Proshred, a locally owned shredding company near me. Prior to their arrival on the appointed day, I spent probably at least 20 hours going through all my old files deciding what it was safe to shred and what I had better still keep. I don’t remember for sure when I did this last, but I noticed right away that for the most part the oldest files I had dated from about 2006. 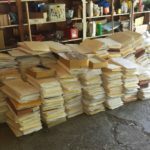 What I finally wound up with was a big pile of bankruptcy files ranging from about 2006 to about 2012 in the middle of my garage floor. There was no left room to park. When the truck arrived as one would expect, the driver who was supposed to do all the loading work had just had back surgery. He showed me the scar. I was planning on helping him anyway, but it turned out to be more like he was helping me. The files were moved from my garage to the truck using a full sized 64 gallon garbage can on wheels. It took about eight trips. I suppose that means I had about 512 gallons of files. Never thought of measuring my work by the gallon before. I could hear the shredding blades doing their work right there at the end of my driveway. Kind of a strange or odd end to all that concern and pain I thought. 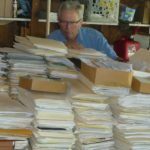 It was comforting to hear from the driver that the remains of the files were going to be recycled and would eventually be used to make new paper at a mill somewhere near Duluth. As the truck pulled away I felt a bit of sadness, followed by a feeling of lightness and relief. I recently posted on Google Plus about how certain things tend to be toxic to a possible bankruptcy. The most common one I see is a Harley Davidson. Other items in this category would include boats and horses, especially if they are fancy and not paid for. This statement resulted in questions being asked about exactly what I meant. If the problem is that a Harley, a boat or a horse are assets which would be lost in a Chapter 7 bankruptcy, then wouldn’t it be better for them to not be paid for. If they weren’t paid for, after all, they wouldn’t be much of an asset. My answer was that such items make a bankruptcy difficult whether paid for or not. If they are paid for, they are assets that very likely would be lost in a Chapter 7 or would increase the required payments in a Chapter 13. If they are not paid for, you have a situation where the Debtor will want to tell the bankruptcy trustee that he or she can’t afford to pay debts, except that somehow they CAN afford to keep paying for the Harley, the boat or the horses. This does not play well. The only thing to do if they really need the bankruptcy is to sell or surrender before filing, or state in the bankruptcy petition an intention to surrender the items after the case is filed. Many have been the times when I have had a potential client disappear never to be heard from again when I said that the Harley has to go. There’s a whole subculture where any kind of misery is preferable to giving up the Harley. Boats are usually a bit easier to let go, but horses are also very hard to give up. One exception might be a case with a 100% Chapter 13 plan. That would be a plan where 100% or the unsecured debts are to be paid. Since the bankruptcy trustee can’t ask for more than 100%, the Debtor would have more wiggle room when it came to something like keeping a motorcycle. Even then the trustee would not like it, but more than likely the trustee could not prevent it. I see very few cases where the payout is 100%. Most people who can afford to do that don’t need a bankruptcy. This post is for general information purposes only, is not legal advice and does not create an attorney-client relationship. I am a Debt Relief Agency. I help people file for relief under the federal bankruptcy code. If you’ve been reading my stuff, you know I’ve said this before. My clients are good people. Prior to giving up and deciding to come see me, they have tried just about everything and anything to avoid bankruptcy. Among the various desperate measures many have tried is the payday loan. What is a payday loan? It’s one of the worst, most despicable, predatory schemes ever devised by the greedy and clever. How does a payday loan work? Well, it’s aimed of course at people who are employed and who as a result have a regularly scheduled payday. It can be done at a storefront or on a web site. These days most of the payday loans I see have been done on line. One starts by providing bank account information along with employment information. This includes the amount of a typical paycheck and when it is ordinarily received. One site I just looked at claims to be able to approve the loan within two minutes. Typically the amount will be about $500, but sometimes it can be more. The money will be deposited into the borrower’s checking account within a day or less. The borrower doesn’t have to repay the loan until after his or her next paycheck is deposited into the checking account. What can be the harm? At about the time the pay check from the borrower’s job is deposited into his or her account, the whole loan is automatically repaid by an automatic withdrawal, with interest – lots of interest. One site I just reviewed states that the annual interest rate will run somewhere between 261% and 1304%. At first it doesn’t seem that bad. For example, at an annual rate of 300% the interest on a $500 loan over two weeks is “only” about $58. The trouble is that once a person starts doing this, it can become very addictive. As soon as it’s been done it once, when payday comes there’s a big hole missing from the paycheck as soon as the automatic payment of the loan is made. So what’s the obvious temptation? Do another one, of course, to make up for the missing money. Pretty soon it’s not hard to start taking multiple payday loans from the multiple web sites that are available for this purpose. Then the extremely high interest, rate which didn’t look so bad at first, can really becoming quite a burden. It can become a treadmill of dependency on these loans. It can interfere with one’s ability to eat, pay rent or buy gasoline. Much like the psychology involved in the slot machines at a casino, somebody has figured out just exactly what is required to keep people coming back and paying in. Usually if I see one payday loan it means my client has been at it for a long time. It may only be one loan, one loan at a time that is. Sometimes it’s two or three or four at a time, enough to entirely consume each paycheck. Even after my client has hired me to do a bankruptcy, and after I have advised the client that this is the point at which they should stop paying many of their debts, there is a tendency to assume that this advice somehow does not apply to the payday loan. It can be a surprise when I say, “it’s your account and it’s your bank and you can stop that automatic withdrawal any time you want” I have had a few clients leave my office in a rush to try to make it to the bank in time to stop the next withdrawal. The StarTribune recently published a feature article about payday loans and one of the big businesses in Minnesota that makes them. According to the article the average interest rate customers in Minnesota pay for a payday loan is 277%. Sounds like theft to me, but Minnesota is among 36 states which allow it. If you find yourself going nowhere and losing ground on this payday loan treadmill, it’s probably time to call me for a free over the phone screening as to whether you qualify for a Chapter 7 or Chapter 13 bankruptcy. This post is for general information purposes only, is not legal advice, and does not create an attorney-client relationship. Nothing on this site is intended to be a substitute for retaining a competent attorney. I am a debt relief agency. I help people file for relief under the federal bankruptcy code. A lot of the advertising about attorney fees for bankruptcy is misleading – even tricky. Today I checked on a Google ad and the web page it leads to which says a certain law firm will file a bankruptcy after a payment toward the attorney fee of only $99. I found this to be not exactly accurate. “You only have to pay the court filing fee of $335 and the credit report / credit course fees of $65 and an attorney fee of $99 to file.” It also said: “Only $99 Down, No Co-Signer Needed, File Now/Pay over Time, Affordable Payment Plans” in big blue letters. I wondered how can these people can be doing this. I could never cover my office rent, malpractice insurance, phone and internet bills and office supplies if I didn’t charge a lot more than that. So I went to the bankruptcy court web site and ran a search for actual cases they had filed. This is not free, so I didn’t look very far. All I did was check the last two cases this law firm filed to see what the attorney fee had been. Attorney fees have to be disclosed on the bankruptcy petition. What I found was that for the last two cases they filed, both Chapter 7s, their fee was $990. And the court filings also said they had received all of the $990 before filing the case. That’s lower than what I would usually charge, but it’s a lot more than $99. Now one thing you should understand about attorney fees in a Chapter 7 bankruptcy is this. If the attorney does not collect his or her fee prior to filing, any part of the fee that is still owing is just another debt in the bankruptcy case. The attorney is just another creditor. The attorney, like all the other creditors, is under an immediate court order requiring that he or she do nothing to try to collect. It is illegal and unethical for the attorney to collect anything from the client once the case is filed. That’s why you may see references to a co-signer in some advertising. The lawyer can still try to collect the fee from a co-signer as long as the co-signer is not his bankruptcy client. This of course puts the bankruptcy lawyer in the position of being a bill collector. I don’t EVER want to be a bill collector. I went back to the web page thinking it must be referring to Chapter 13 bankruptcy only. When it comes to paying attorney fees after the case is filed, a Chapter 13 bankruptcy is a very different animal from a Chapter 7. If you file a Chapter 13 bankruptcy it is possible to pay part of the attorney fee through the Chapter 13 payment plan. I hit Control F to search the page and typed “13” into the search box. No mention of “13” or “Chapter 13” appears anywhere on the page. The page seems to be talking about Chapter 7. The only filing fee the page mentions is $335, which is the Chapter 7 court filing fee. The court filing fee for a Chapter 13 is slightly lower. When I look at their web page I can see that it is very slick, and at the bottom is the name of a web development company that designed the page. I can remember a few years back when I hired a person to redesign my page. The person I hired started adding all sorts of new key words and content, which was submitted to me for review. There was a whole lot of it, and it was hard to keep up with what the designer was doing. Is it possible that the web designer wrote up this stuff while the law firm was not paying attention? It could happen. I’m now back to doing all my own web design work. I found that having my web page in the hands of a professional design and marketing person was scary. So maybe they just have a busy marketing person who they can’t keep up with. Maybe it’s not entirely the law firm’s fault. But I do want to suggest to you that you should be very wary when you see something like this and don’t be taken in by it. If it seems to good to be true, it probably is. This posting is for general information purposes only and is not legal advice. It does not create an attorney-client relationship. I am a debt relief agency. I help people file for relief under the federal bankruptcy code. I don’t know what banks and credit unions are doing in other parts of the country. I speak here only of what I have seen and heard about here locally in Minnesota, and specifically just the Twin Cities area. Here in Minnesota, in the Twin Cities area, there is a substantial danger that your savings and checking accounts will be seized or frozen by your bank or credit union when you file a personal bankruptcy. I have always believed it to be a despicable thing to do. Some banks and credit unions are worse than others at doing this. When you choose a lawyer to handle your bankruptcy case, you might want to make sure that he or she is a person with enough experience to be aware of this problem and how to head it off before it happens. The problem is this. If the bank or credit union is one or your creditors, you can expect that institution to seize your accounts as soon as they are notified of the bankruptcy. If this is not planned for it can result in quite a surprise – checks bouncing, a debit card that has stopped working, and the evaporation of money you thought you had. There are some banks that are worse than others when it comes to this problem. They might freeze your account even if they are not a creditor, especially if your account has a fairly large sum of money – something in excess of $3,000. I don’t want to mention them bank by name here, but I believe I did mention one in this video. You should expect your bankruptcy attorney to coach and advise you as to how this is to be avoided. What I tell my clients is that if they have an account with a bank or credit union which they owe money to, that account should be closed well in advance of the filing of the bankruptcy case – whether it’s a Chapter 7 bankruptcy or a Chapter 13 bankruptcy. If you don’t close that account, the bank or credit union will claim a right of setoff against your money in the account, which is a fancy way of saying that they will seize the money. There are certain banks where all accounts should be closed if at all possible, whether you owe them money or not. Once they seize the money you won’t get it back – or at least usually won’t. So the thing to do is to close all such accounts before you file your bankruptcy case. It takes planning of course. I’m not saying you should try to live without a checking account. What you need to do is open an account at a bank which is NOT one of your creditors, and get all your automatic deposits and automatic withdrawals up and running with the new account before we file your bankruptcy case. I believe that the best banks to use for this purpose are the small neighborhood banks – for example a bank with a name that starts with “State Bank of …” or “Citizens Bank of …” The process of getting the new account set up and getting the auto deposits and auto payments moved over to and set up at the new bank may take a few weeks, but I consider this to be part of the normal planning and preparation that goes into making your case as painless as possible.